If you own an international version of the Galaxy S III which arrives with model number GT-i9300 then there is some good news in store for you. According to Android Central, Samsung is planning to release the Android 4.1 Jelly Bean upgrade for the international Galaxy S III smartphones after it winds up its press meet at the IFA back in Berlin on August 29. This news comes in from sources of Android Central close to plans of Samsung and says that the upgrade is in the final stages of testing and will be announced along with the launch of the Galaxy Note II. 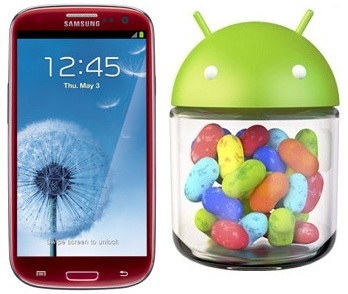 The Android 4.1 Jelly bean upgrade is ought to bring the familiar features like a redesigned notification shade, Google Now, buttery-smooth usage and also new TouchWiz features like ‘Dormant mode’ for better notification and alerts. Along with it an ‘easy mode’ is also arriving for simplified home screen operation by the S III users. All of these information’s about new features have been extracted from the leaked Jelly Bean ROM for Galaxy S III. So it is time to rejoice if you own an international version of Galaxy S III and just about a week to go until you taste some Jelly Bean love.